Halogenius is a mind twistingly, difficult, but fun new game by the developers at Gameplay. There are several levels, each one significantly harder than the previous one. Try to build a halo model identical to the one shown to you in the bottom, left hand corner of the screen. To build the models, just tap on a square and it will light up, tap adjoining squares and they will light up too, but the number of the first square will change. The numbers start at one and go to four before starting over again. The number changing thing doesn’t sound like a big deal now, but trust me, after you start playing this game you’ll understand the importance of it. I started to get the hang of this app after a few minutes of tapping the entire screen wildly to see what happened (nothing, you lose, this is just how I learn to play games). There are two modes: walkthrough and survival. In walkthrough mode try to solve all the game levels, choosing from normal, difficult and insane modes. In survival mode you are timed, so try to solve the randomly generated puzzles as fast as you can. Bonus points if you solve the halo model with time to spare. The graphics are perfect for the game. Since the game itself gets pretty difficult, the simple layout is appreciated. A big thanks to Gameplay for the undo option also, just tap on the last square you set to undo your move. Each time you open the iPhone app, you have the choice of resuming play in the name of the person that played it last, or you can switch players and create a new name and game. Halogenius is also classroom and office friendly; just go to settings and turn the sound off. Good luck with this one, well worth it! 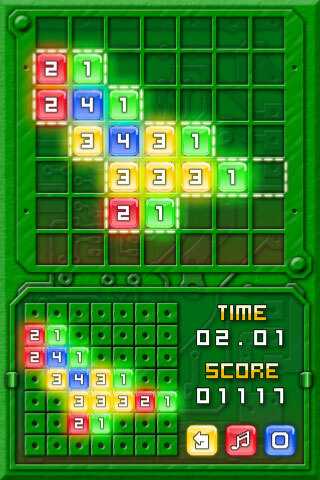 AppSafari review of Halogenius was written by Amanda McFarland on April 6th, 2010 and categorized under App Store, Fun, Games, Puzzler. Page viewed 3388 times, 2 so far today. Need help on using these apps? Please read the Help Page.